I am relieved to have made it to the middle of the week...I just started off the week tired, and when that happens...I just feel grouchy :( I did get 8 hours of sleep last night, so hopefully today will be brighter (for everyone), LOL!!! I am on a SU! card makin' roll. I pulled out another of my favorite SU! sets (retired)~Happy Hearts...don't you think this heart image looks like a cowboy hankie? 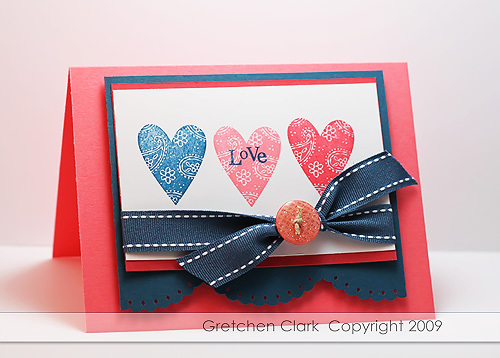 I also used some Cameo Coral (I used to use this color all the time...until I discovered Berry Sorbet from PTI), I also added some Ruby Red and Not Quite Navy...really a pretty color combo, IMO. Yesterday I picked up my new glasses (although I wear contacts the majority of the time)...when I got home Mike didn't even notice (which is not really like him~nothing EVER gets past him!). I said "do you like my new spec's?" and he said they look like my old ones~geesh!!!! At least I can see better with them!!! You can see them here. I am planning on taking off a few days next week, to just do some fun stuff~stamp, take pictures, organize (I know weird...but I think it is fun), and go through my SU! stamp sets. I am going to put them on EBay and hopefully send them to a new home...if you are interested in my "For Sale" list of stamp sets, leave me a comment (make sure you leave me a way to get a hold of you) or email me and once I get the list together I will forward it on to you. I hope your Monday is off to a great start...I did absolutely nothing productive over the weekend. I just felt like doing nothing~so I did, LOL! I am sure I will be stressed this week, feeling like I am behind, but oh well, sometimes you just gotta let the housework and groceries go!!! Which makes me wonder what we will have for dinner tonight!! I did have some time in my craft room~which made me happy!!! I pulled out some of my old SU! sets and was feeling pretty creative (: I will try to not post a Papertrey card this week~it will be hard, but I can do it!!). I used one of my all time favorite SU! sets Petal Prints...this one has gotten inked up a lot in the past (I think it is retired now). I just love it!!! I don't think I will ever part with it. 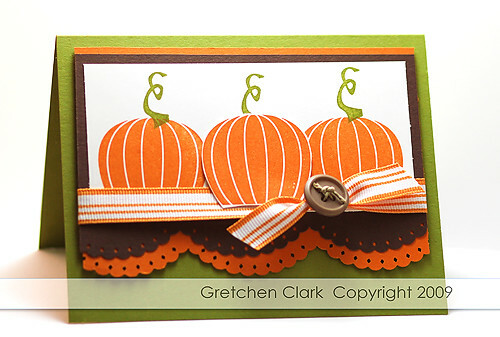 I also used another fav of mine...Lots of Thoughts, and of course I had to use some ribbon and a button (I def need a 12 step program~I am Gretchen, and I am addicted to buttons!!!). 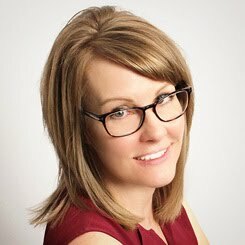 I was contacted by Carol about a week ago...she is a sweet blog reader (: She asked me if I would mind if she posted pictures of my craft space in her article for the Examiner, I was honored and excited that she asked~thanks again Carol!!! Here is the link to the article...it was really neat to see my space online! 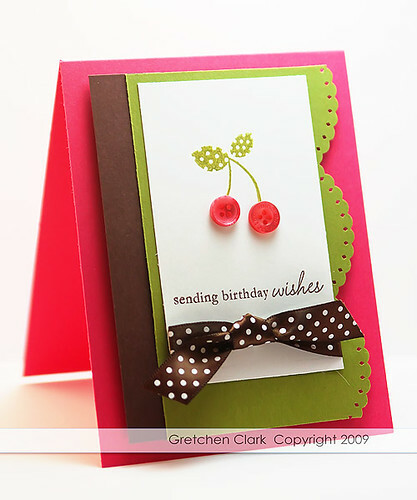 Of course I had to make her a cute card, with buttons and ribbon...*smile* I pulled out my Everyday Button Bits (which has gotten a lot of use these days...sorry if you are getting sick of cards with this set), and decided to go with the cherries (love them, lol!). I am thinking I may need to make a PTI order soon...because I am starting to feel the need for some new stuff!!! Ashley is in California with Nate for a conference until Monday night, so that means I am working today (I had to do a 5 day work week *crazy*, LOL! I am realizing how spoiled I am to have my Fridays off!!!). Lots of stuff planned for the weekend...hope I can get it all done, I may just decide watch movies with Mike! 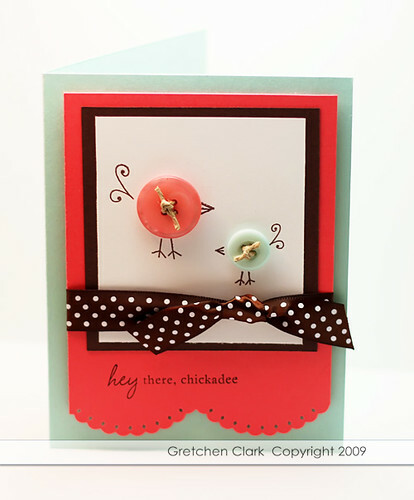 I made this card for a friend of mine that I just reconnected with on Facebook (love that place!!!). 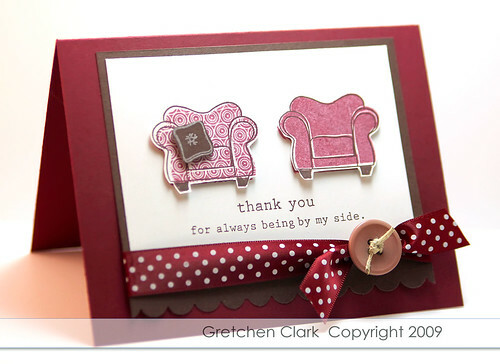 I just love the sentiments in the On My Couch stamp set!!! They are just so stinkin' cute!!! 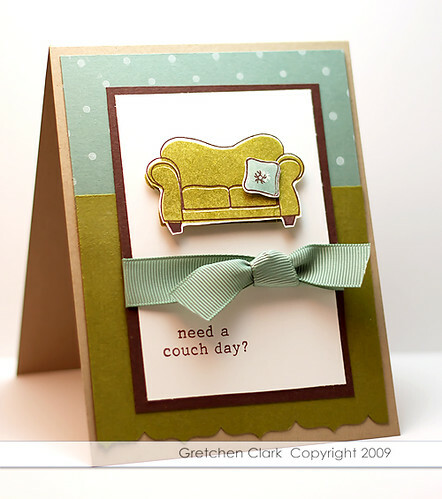 Somedays you just need a couch day, right? And I am starting to realize that I have an addiction to buttons!!! Now for some randomness~I recently went to the eye doctor (March), for my yearly exam...and my prescription pretty much stayed the same from the previous year, so I bought a years worth of lenses...well, over the past few weeks I have has some serious issues with my vision!!! I called the Doctors office and got in for an exam~my left eye went up 2 steps (I am nearsighted) and my right eye has astigmatism!!! No wonder I couldn't see, LOL! Unfortunately since I cut the tops from my contact boxes for my rebate I couldn't return my old lenses~BUMMER!!! But on the up side~Ashley helped me pick out some new glasses (will post pic's when they come in this week). Needless to say, I will not buy my contacts in bulk anymore!!! Getting old kinda stinks (the eye doctor even used the B word with me~you know...bifocals *gasp* I am holding off on those for now), LOL!!! Today is gonna be a quickie!!! I have been swamped! Today I hope to catch up a bit...fingers crossed!!! I have been trying to get into the fall mood...but since the temps here in AZ are still around 100 degrees~it doesn't quite feel like fall yet. I have some really great blog readers/friends!!! *smile*. 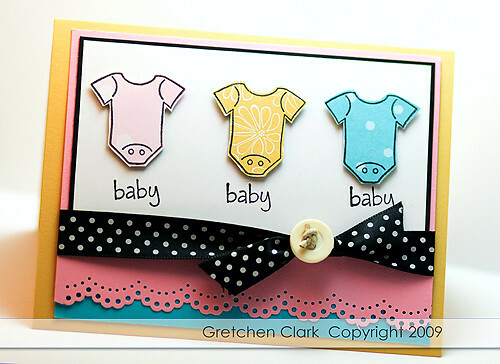 The card above is from Shelli, who I email/FB on a regular basis...she just started blogging a little while ago...you can check out her blog here! The second card is from Willa Jean, who I have also met through my blog, she is the sweetest person and lives in a state that I used to *smile* (not sure how much info she wants me to give out). I just love getting cards in the mail!!! Especially hand made ones. I have to say I am so blessed through this old blog of mine!!! I have met so many wonderful people who share the same addiction~I mean hobby that I do. My favorite day of the week...I know I say this every Friday, LOL! On a more serious note...just remembering the terrible events that took place on this date 8 years ago!!! It is hard to believe that it has been 8 years since that tragedy! Our city lines the street I drive to work on with American Flags...gives me goose bumps every year! I am so proud to be an AMERICAN!!! 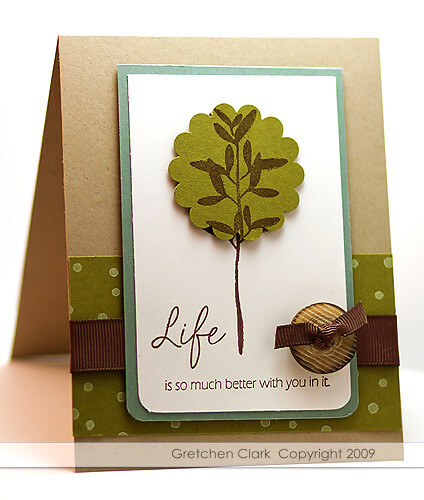 I found out yesterday that 3 of my cards were selected for the January 2010 Stamp It magazine (Paper Crafts)...Woot Woot! This week is moving right along~it really helps when Monday is a holiday, LOL! 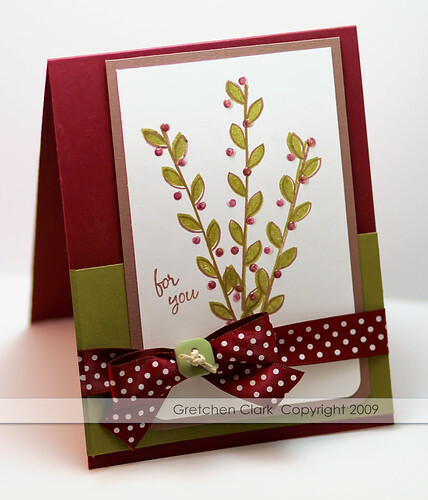 I was playing around with my Rustic Branches set the other day (haven't inked it up in quite a while). I used Scarlett Jewel and Ripe Avocado (with a little Close to Cocoa and Whisper White)...very fall~ish looking (even though the temps are very summer like here in AZ...104 yesterday). And you cannot see in the picture...but I added some Crystal Effects to the berries to give them a little shine and dimension. I am a single gal again this week, Mike is out of town for work again...it is kind of weird having the remote all to myself, LOL!!! Although I don't really watch too much television these days, I am really excited for the new season of the Office, Til Death, The New Adventures of Old Christine, Biggest Looser and Two and a Half Men to start up (it has been a long summer with nothing on the tube that has interested me). I hope you have today off from work and are enjoying a long weekend!!! 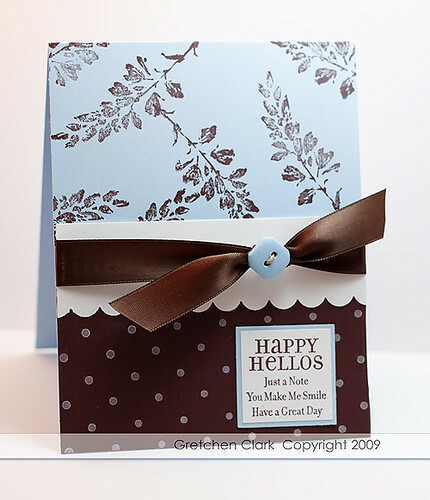 I had some time in my stamp room over the weekend...so that makes me pretty happy!! Today I am spending the day with my hubby, before he heads out of town again for work this week. Not sure what we will do, but we are quite happy just hanging out watching a movie together. Yesterday I was surprised to find this back~yummy! Of course I got mine with non fat milk and without whipped cream (to save a few WW points)...still delicious, I might add. 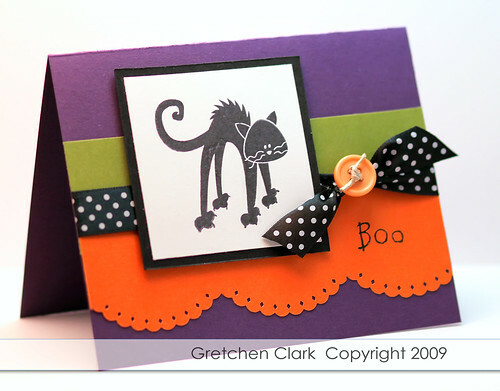 So onto the card...I thought I would make another Halloween card (so I can have a few on hand, as Halloween approaches), and used my new set called Halloween from Recollections (purchased at Michael's for $6.99~SCORE!). 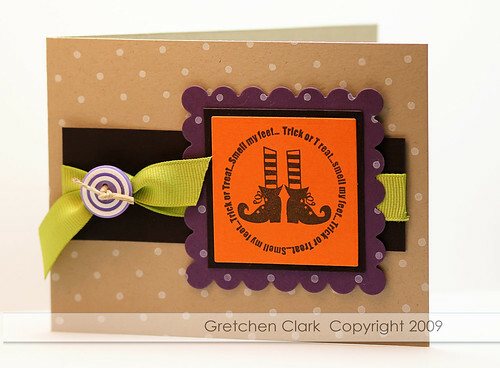 I think I am stuck on this color combo for Halloween type items, LOL!! I am so exited to have a long weekend~GLORIOUS!!!! I am not sure what I am going to do, but knowing I can sleep in an extra day, just makes me smile!!! I have been seeing a lot of Halloween blog posts this week...so decided to jump on the Halloween bandwagon (I am not much of a Halloween person, but like to have a few items on hand). I stopped at Michael's after work on Monday to pick up another border punch (I had a 40% off coupon), and found some really cute acrylic stamp sets (I always check out the stamping aisle, LOL!). They are by Recollections, I came home with a Halloween themed one and a baby themed one (I need to make some baby cards~lots of expectant moms at my church)...for only $6.99 each. Of course I had to use my new goodies!! 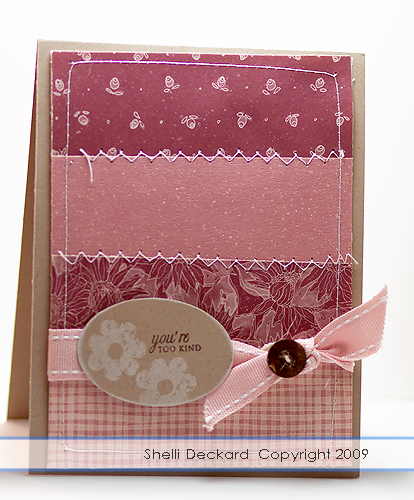 And I have to say~I am loving this new punch~Diamond Lace! Have a Glorious long weekend!!!!! How is your week going? I have been a "single lady" (insert the Beyonce' song here, LOL!) this week...Mike is out of town for work. I thought that I would have so much time to stamp/own the remote/etc, but I don't know where the time is going??? Maybe staying on the computer until 11 pm on Monday night wasn't a great choice...but I just lost track of time (I am such a computer nerd!). Enjoy your day...the weekend is in sight!! !